Repertoire Fashion has become a popular store for premium designer clothing for men and women. Stocking the very best in designer clothes, Repertoire Fashion boasts are huge range of brands including Belstaff, Michael Kors and Stone Island. 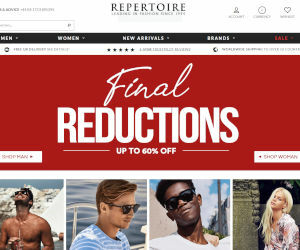 Look out for the best voucher codes, discounts and sale information from Repertoire Fashion.